In today’s underwater environment, complex missions, such as underwater repair and docking operations, require precise control to maneuver unmanned underwater vehicles (UUVs) in extremely demanding operating conditions. Although numerous control methodologies have been used for UUVs, adaptive control is considered a promising solution due to its inherent ability to adapt to uncertainty and parameter variations. Nevertheless, it is handicapped by the tradeoff between low adaptive gains and tracking performance. Low gains are preferred to maintain stability and obtain smooth control signals. However, the resulting tracking performance, especially during transients operations, does not allow for precise maneuvering. A possible solution is model reference adaptive control (MRAC) with composite adaptation modification, which uses a prediction error in addition to the tracking error to improve learning without increasing the adaptive gains. Even though this is not a new modification to adaptive control, there is little evidence in the public domain of extensive experimental validations and quantitative analysis under low adaptive gains, especially for underwater operations. Furthermore, newer versions, such as composite MRAC (CMRAC) and predictor-based MRAC (PMRAC), offer several additional advantages. In previous publications, the authors have verified CMRAC and PMRAC for UUVs through computer simulations. 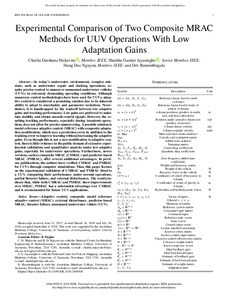 Thus, this paper focuses on the experimental validation of CMRAC and PMRAC fitted to a UUV, comparing their performance under normal operations, partial thruster failure, and external disturbances. The results indicate that, while both CMRAC and PMRAC show improvements over MRAC, PMRAC has a substantial advantage over CMRAC and is recommended for future UUV applications.